Free-to-play online game Phantasy Star Online 2 was hacked, and non-playable characters were moved about as, it seems, some sort of prank. In the game's Ship02 location, non-playable characters were moved out of players reach, making it impossible to interact with important NPCs. 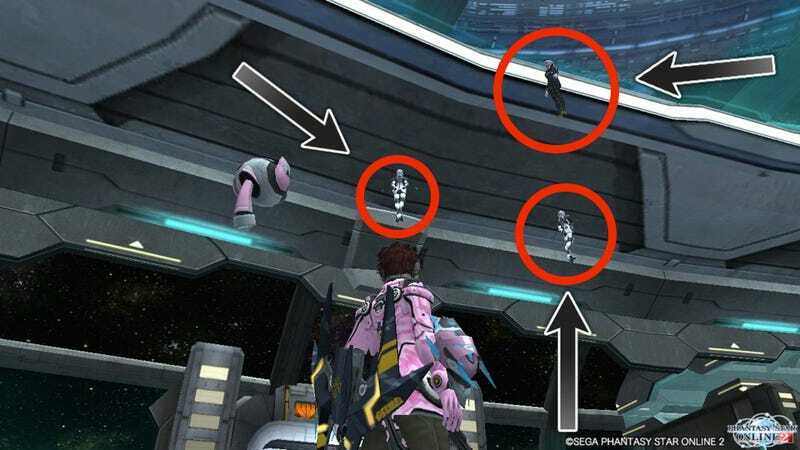 As you can see in the screenshots, the non-playable characters were placed on high structures and behind glass. Today, Sega announced that it was aware of the hack and that it was investigating the matter. Sega also stated that player data was not leaked in this hack. If you happen to see non-playable characters moved into funny locations, Sega asks that you move to another play area. If you see cheaters, you can report them via the wicked user form. Japanese sites are blaming foreigners for the attack and are pasting chat transcripts that seem to indicate that the alleged hackers were English speakers who are apparently upset that the game doesn't have global servers. The chat log seems to indicate that these individuals have been doing this since the game's closed beta and that they think they should do this NPC shuffle again. Sega has aggressively being going after cheaters and individuals engaged in real-money trade transactions. So far, 75 accounts have been banned. This alleged griefing could impact how Phantasy Star Online 2, currently in beta in Japan, is rolled out in the West next year.